After a few slices of pizza, it was time to get back to work around the Boatworks. I picked up my contribution to the Fibers show, which officially closed last night. Then it was time to deal with the next show, the Grass Roots exhibition. This is a show of art made by people who took classes and workshops there in Belmar this year. My woodcut class ran three times in 2014, so anyone who took it was eligible to put something in this show. This was announced back in the spring, and I reminded all my summer people about it during the classes themselves. Once entries opened on the show, I reminded everyone again, either when I ran into them in person or by e-mail. In the end my class will be represented by 7 woodcut artists. Much of the work was done in class, but artists could bring in things started there and finished later. For example, above the prints to the left (Sue) and right (Joan) look like they are probably ones pulled there in the back room of the Boatworks. The one in the middle (Lauren) was first proofed in my late summer class, but those were black ink on a variety of white papers, while this one uses chin colle and a series of Japanese papers of varying tones, which means she was paying attention to my demonstration of this technique and found a way to adapt it to her work. Below, Mary's piece (left) is the one she showed me in progress at the last critique, and I'm glad to see she got it to a state worth showing. We printed the center part of Beverley's piece (middle top) in class, but she added the cloth border later, while I see no images of Denise's print (middle bottom) in my records, but it seems familiar so perhaps she was working on her design back in the spring. 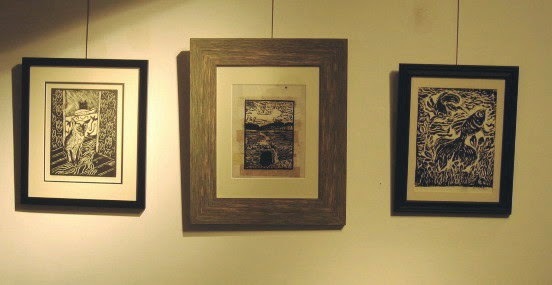 The white line cat print on the right (Stan) is a print that he finished during our late summer class. 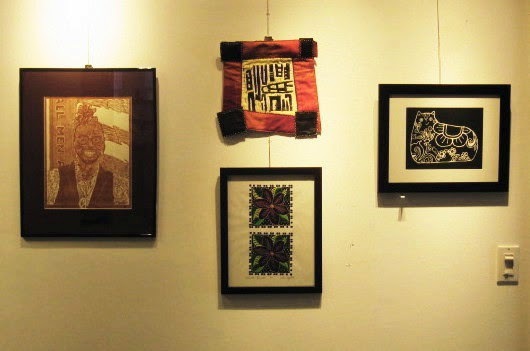 These seven pieces are among the 54 total works in the show, a mix of paintings, drawings, photographs, fabric constructions, and other items. From what I saw of those other media today, I think we printmakers stack up nicely. It opens next weekend with a reception on Saturday from 5 to 7 pm. The unusual numbering in the title of this post is due to this being essentially a continuation of a series last seen on this blog in 2007. 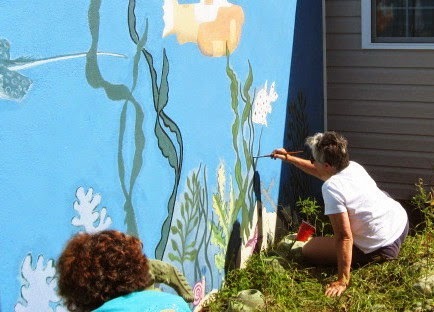 Way back then the Belmar Arts Council was starting on what would become the first of many murals around town and I was one of the main painters on that project. And since there wasn't yet a BelmarArts blog, I covered the whole thing here, from July to December of that year. 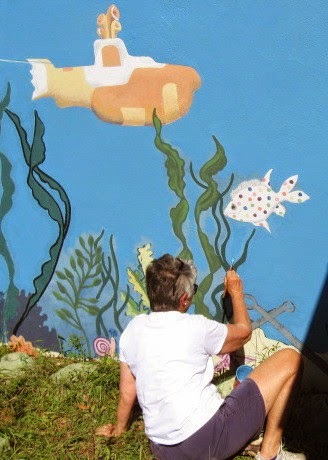 Anyway, it was decided recently that it was time to spruce up this seven year old mural, not really damaged, but definitely faded in 7 years of unprotected sun exposure. This actually began last week, but I couldn't be there for that. Since I had other business there at the Boatworks today, I decided to get there early and help out with one of my old projects. Above and below are some things other volunteers were working on before I joined the effort. 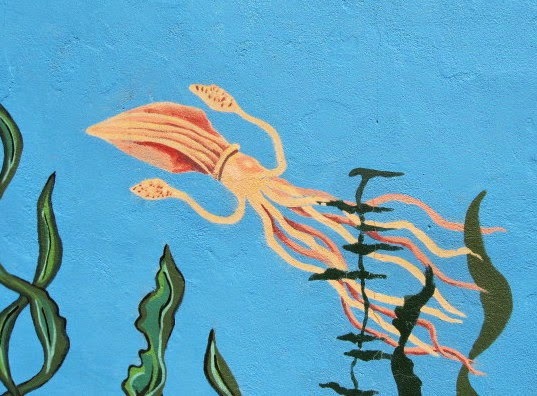 We're not creating anything new with this mural update, just repainting to make the colors stand out a little better. 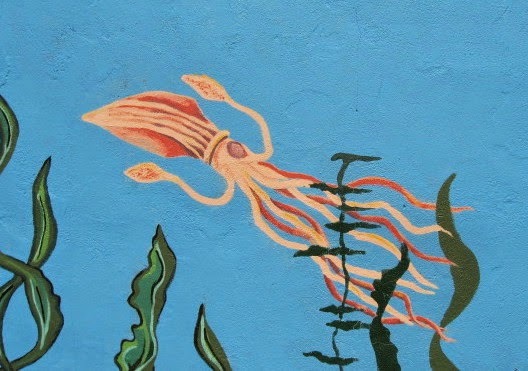 Today I was asked to take on a large squid on the left end of the underwater part of the mural. Not a piece I worked on seven years ago. Those original paints are long gone now, so we have just a bunch of paint colors and are going to try to match what was on the wall as best we can. Above is shown what the squid looked like around noon, and below about an hour later. Although every square inch of the creature was repainted, I was matching colors as closely as possible, so the differences are few. Comparing both, the most noticeable change is to the eye. There is a whole lot of mural not retouched yet, so depending on how things work out with my schedule, there may be other updates in this space. It's been a little over a week since I did the above sketch with pencil and markers to show at the recent critique. In the time since I have given it some thought and done some work, so here's an update. I live across the street from the supermarket that inspired this piece, and it's not unusual for me to take a quick walk over there a few times a week when I need something. This past week when I did that I would often have paper with me and make some quick reference sketches on location, and then work them into something more later. 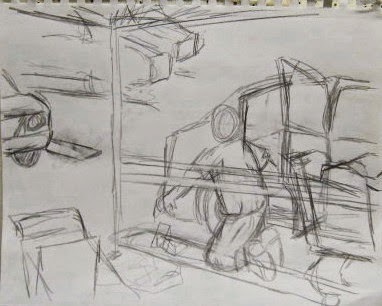 In the above photo, the page on the right shows sketches of things like the relative position of two cars in the lot, and a row of shopping carts. 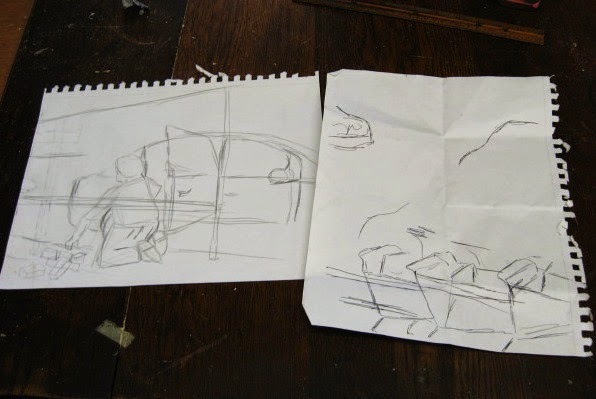 The page on the left shows an update to the composition, with changes to the cart corral structure, as well as adjusting the relative scale- the man is a more logical size compared to the car. In the afternoon today I drove up to the Studio. 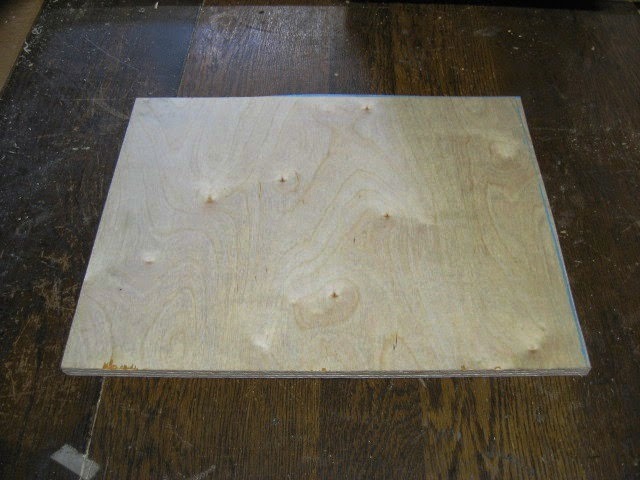 If nothing else, I needed something I will use in tomorrow's drawing class, but I used the opportunity to prepare a piece of wood. This past year I switched my Belmar woodcut class over to birch due to the poor quality of lauan that I've found for sale in the home and lumber chains. If I see some decent pieces in the future I would consider buying it. But for now I used some of the remaining birch that I had from the summer classes and prepared a new block, which will be the first supermarket print on birch. While up at the Studio, I decided to do yet another paper compositional sketch of the idea. This one includes some of the ideas from above (better relative scale, positions of other cars, shopping carts), though there will still need to be changes to relative positions of items, and perspective needs a whole lot of work. But I think the idea is fine, so I'll work out those things and I hope to be sketching on the wood in a week or so. Tonight my brief run as a university printmaking professor officially came to an end. This is not to say that I won't teach print stuff again, as I have been demonstrating cutting and printing at colleges since the 90's, and I still am planning print projects for both of my current college classes. But for the past few weeks I have been the official printmaking faculty at one of my schools, and that's now over. (actually the computer system may still list me that way for weeks, knowing how long it takes them to get things updated) I had gotten word from the dean's office late last week that the regular professor was expected back this week, but considering the lack of communication through this whole process, I had little confidence in anything I was hearing. I'd been keeping up with all the involved parties through this, but no one else was. So I decided I would go up there tonight. If she was back, I'd turn over the paperwork, keys, attendance records, etc, we'd settle all the questions raised by students, and since the southbound traffic would be a nightmare at that point, I'd offer to stick around a few hours and help the students get moving on their first projects, due next week. And if she didn't show up, I'd do the demonstrations of cutting and printing that they'd need to do their first prints, and then wish them luck. I arrived about an hour before class, finding one student in the room cutting her block- not waiting for the demo but just figuring it out. Hey, I did my first woodcuts that way, and this girl did do a woodcut in my 2D class years ago so she had a little relief experience. I did take a moment to give her some tips on how to hold tools and let her try one of my specially designed bench hooks, two changes she adopted immediately. I showed a book I had brought in to two of the grads, as the work had relationships to things each was working on. I brought in my supplies, a stripped down version of the stuff I was bringing in the first two weeks. The regular professor turned up about 30 minutes before class, and I gave her a quick update on things. She was very excited to have me stay a help her get back into the rhythm of the class, especially because relief is my thing. The room quickly filled up and the usual chaos followed. (too busy to take any photos tonight) I made a quick portrait sketch on a spare piece of linoleum (image borrowed from an old student print) and did a linoleum cutting demonstration, followed quickly by showing how to hand print a block. Shortly after the professor followed up with a demo of inking and printing using the press, (the student cutting when I arrived was lucky enough to have the only completed piece in the room, so got her plate proofed twice and is all set for next week's crit) I remained there for a little while, answering questions, advising on prints in progress. Talked about woodcut tools, even though that project is still a week away and most still have a ways to go on their linocuts. And then I took off. So having turned over all the relevant papers and information, this temporary professor job is over, However, in a room full of students excited by their pieces, there's always the possibility that one or more may convert over into a full time printmaker and go on to make works that future art students will be studying and emulating. For those of us who have been called, the making of new printmakers is almost a sacred duty. And passing along as much information and advice as I could over the three weeks is the best way I know to possibly make that happen. The first Monday this month was the Labor Day holiday, and so that was out for our critique group. And Molly told me she couldn't make the 2nd Monday of the month either, and my schedule isn't allowing me to do Tuesdays right now, so she suggested the Wednesday of this week. I put the word out, then she called me at school last night to tell me she had just realized she had something else to do and would't be coming. Too late to change it, so once again I'd be running it myself. Preparing for school has kept me too busy to think about art the past few weeks, so this afternoon I began preliminary planning for a new supermarket print, doing a sketch there in my Studio in the hours before the scheduled crit. I got it done in time for the 7:00 start, but there was no one else there. I was considering giving up when my woodcut student Mary showed up about quarter after. As happened during the last month that opened with a federal holiday, we had just me and one other person. Mary brought a new block in progress, a portrait of a person she met on a day in NYC that she considers one of the most artistically exciting of her life. There's a lot of fine detail in the block that we hope survives into printing. My drawing is just a rough idea, but she liked the concept. I closed up the shop, and then the building around 8:00 and went home. Critique time has come upon us again and I've been so busy getting ready for the start of the semester, I hadn't had time to start anything new. Usually when I have no major project going and I want to have something new to work on, it's easy to turn to a saint, but this time I decided to go with a supermarket print. And of the ideas I've been sitting on, the simplest and easiest to put into production was something from not too long ago, when I was in my car in the parking lot of a supermarket, listening to the radio for a few minutes before going in. 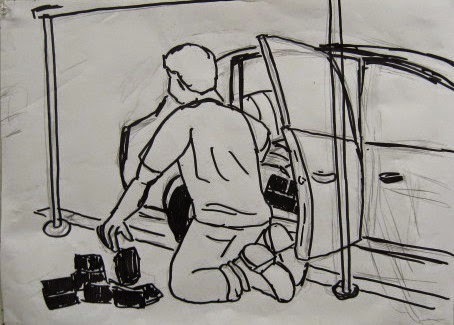 I saw a guy kneeling on the ground next to his back door, taking things out of the back seat area. I thought he was rearranging stuff, but then he got into the car and drove off, having left behind a pile of bricks and concrete, perhaps from the demolition of a set of brick stairs. Why he decided to abandon this debris next to a shopping cart corral in a supermarket parking lot I had no idea, but the same could be said for a lot of the things that inspired prints in this series. I knew of no scheduled events going on at the Studio building tonight, so wanted to get there while I knew for sure there'd be people in the building and the alarm would be off. 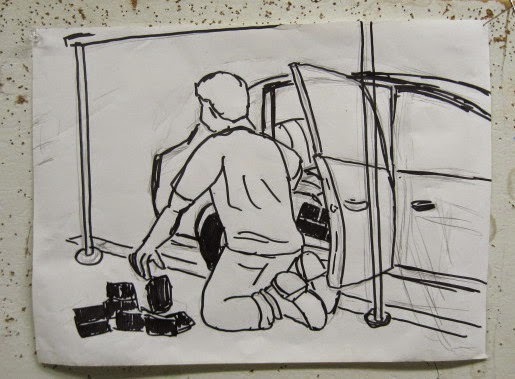 I stopped in the parking lot of my building on the way out, long enough to make a quick reference sketch of the type of car I had seen that night, and got to the Studio by around 4:30 pm. For the figure I used myself in a mirror; since the full length mirror I had there was destroyed by the workers cleaning up after the winter flood this year, I had to make use of one in one of the dressing rooms. Molly stopped by for a while to do some work, though she was not going to stay for the critique, and we updated each other on the new fall jobs that we have. I still had enough time to do the above very rough paper sketch, going over it with a black marker to make it easier for people to see. The relative scale of the elements is off (the car needs to be much larger) and I will need gather more details for the scene, but I think the general idea is good and it will work as part of the series. It's been a couple of weeks since I posted anything here. The gap is not for total lack of art related activities, but some lack of spare time. It's the time of year when a new semester begins, and with it all kinds of changes to my schedule. Now is the time to catch up a little bit. A couple of weeks ago I was doing some grocery shopping when I received a call an my cell. I didn't recognize the number, but it was a Jersey area code and I was waiting to hear from someone about something, so I took the call right there in the soda aisle. It turned out to be Steve McKenzie, to whom I had sent a shipping box the previous week for return of my prints (of supermarkets by coincidence) from the Newark show. He was calling to let me know that he had received the box and to sing my praises. He said it took only two minutes to open the box and repack it for shipping (not typical of what gallery directors go through) and the threw around the term "Box Master", though I have to throw a little credit to Lee White. He even suggested that I could teach a class in how to do this. It's not that I couldn't teach it, but I doubt there is much demand. I'll stick with woodcut. This time of year, you tend to dread phone calls from your art department secretaries- it usually means they are about to take some classes away from you. 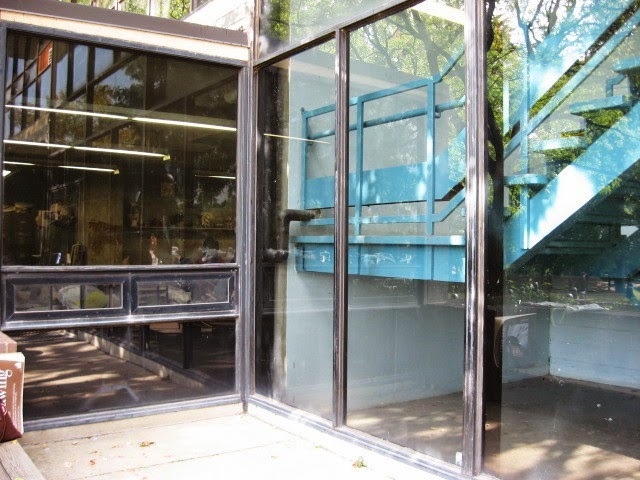 But this turned out to be a good call, an offer to have me cover the printmaking classes at the university temporarily while the professor was absent. Relief printing mostly, so not much to do to get ready, and I'll be using her syllabus. From my other school I got a call asking if I would consider another schedule besides my one remaining drawing class (my 2D had already been cancelled), since it might have to go to someone else, but I had conflicts with the other options, so I had to wait out a few tense days. Later in the week I went in to drop off stuff for copying and finally got my schedule confirmed, but also news that the school was switching to a new computer system to be used in all classes. And though it's not actually functioning yet, we have to start using it immediately. Meanwhile, I'm waiting until after a special show devoted to artwork from people who took classes in Belmar to run my next class there, using good prints from my previous students to try to bring in new students. Started looking at my schedule and the options available. Then after the Labor Day holiday, school begins. And it began with that print class. Actually four print classes running simultaneously, because that's the way colleges do things in the 21st century. Still a lot of things to be worked out, and since it's unofficial I needed help from the dean just to get my class rosters, but I came in early to deal with that and get all my copies made for the semester. After going through all the syllabi and letting the know what to expect during the semester, I went into the one things that is enjoyed by all print students, from beginners to advanced grad students- looking at prints. We looked at some slides of historical work (a bit shocking what some of them didn't know about), but the real fun came when I pulled out some of my exchange folios. There are some seriously skilled print artists in the Outlaws and related people who did these, with ideas way outside what few prints make it to the art history books. (some of these artists are in the NY Public Library's print collection, which they will see on a class trip later this semester) My plan was to get everyone excited, and to get the grad students thinking about ideas for their independent project this semester. Not to copy anything specific, but just to see what can be done. On one of my non-teaching days I was back to school to get my computer training. They had been asking us to do this on our own, but between not knowing for sure if I had a class until a few days earlier, and the fact that the system doesn't work with my computer, that hadn't happened. Plus, I did much better learning the previous system with in person training. Two hours later I had my class gradebook set up and knew enough to get through the next several weeks. The students still won't be able to use this, but I have alternatives for them. On the way home I stopped at in Manasquan to check out the just arrived prints from Newark. Opened it up, and my box had been successful. After consideration of the Boatworks schedule through the fall, I realized I had no alternative but the usual Tuesday nights so I went ahead and put my woodcut class on the schedule for four weeks in October and November. Called it in Friday (just before my drawing class, which went as expected), then today stopped by to verify the new pricing (going up a few bucks per person to reflect the more expensive wood we switched to) and to gather information about the member pages we'll be having on the website. By the end of the day I had e-mail in photos and text to put up there, but that was at the end of the day, so it won't go up until sometime next week. So two very busy weeks, and none of it involving making any new art. But we have a critique scheduled for next week, so I should try to at least get something down on paper in the next few days.